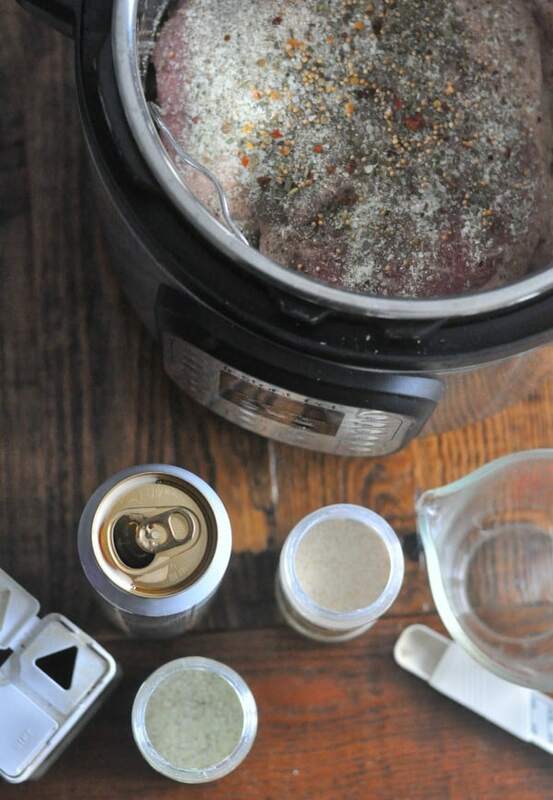 Easy Instant Pot Corned Beef recipe made with beer, beef stock, and seasoning. Makes a great shredded corned beef perfect for Reuben Sandwiches or served with potatoes! This Instant Pot Corned Beef recipe is part of my series about how the Instant Pot is helping me with meal planning each week. This post contains affiliate links for products that I use and endorse. 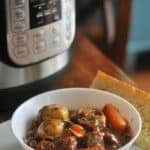 This easy recipe will show you how to make a comfort food classic right in your Instant Pot and how doing so will save you meal planning time each week and give you more time with your family. I bought my Instant Pot after hearing from friends who swore the kitchen appliance was saving them time in the kitchen each week. Yes, to saving time and being able to use that time to have quality time with my family later! I’ve found that the more time I spend meal planning or using tools that cut cooking time, the more time I get to spend with my family. 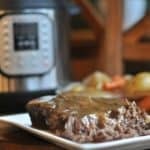 If you are new to using an Instant Pot, go check out my videos on my meatloaf or pot roast recipe for tips on getting started and how to do the quick pressure release. 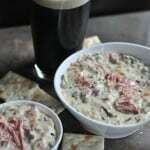 I’m using a packaged corned beef that contains a seasoning packet for this recipe. 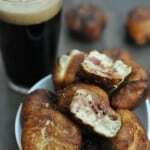 You should use a stout beer for this recipe, I like to use Guinness and I’ve also used a Coffee Stout in this recipe. 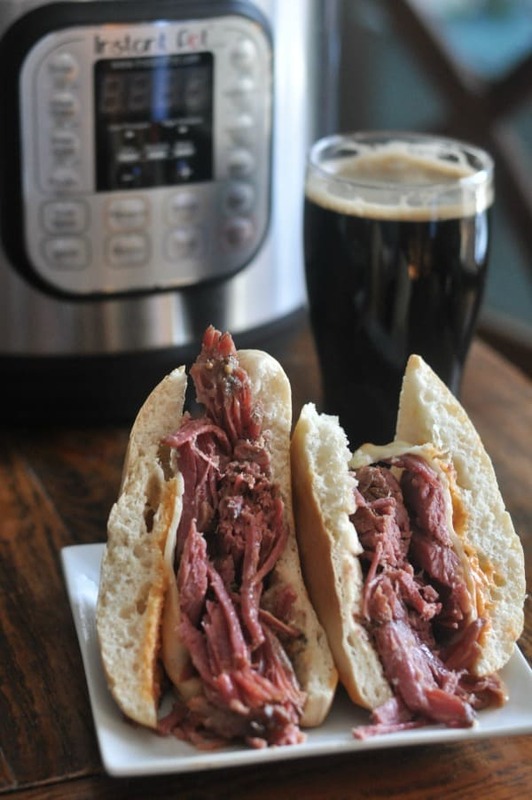 My husband absolutely loves corned beef and I love a super easy meal that isn’t fussy and has yummy leftovers that can be made into other meals (baked Reuben sandwiches and Guinness Wild Rice soup). And I love it even more if I can put it in my Instant Pot and do something else while it cooks! 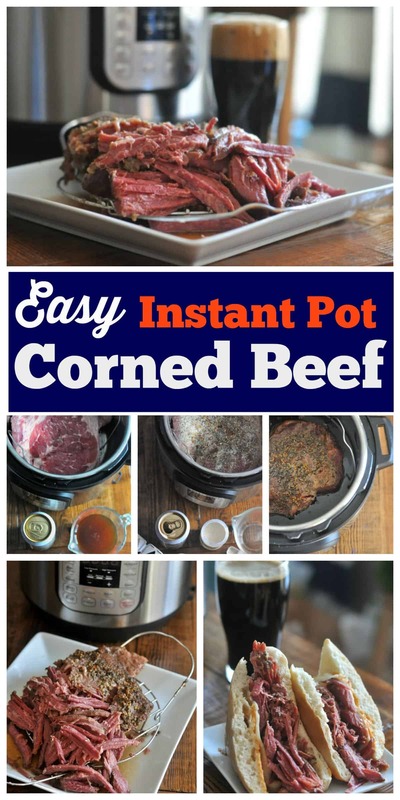 My best friend called me this week, knowing that I’ve been using my Instant Pot for meal planning, she said that I had to try doing a corned beef in the Instant Pot. 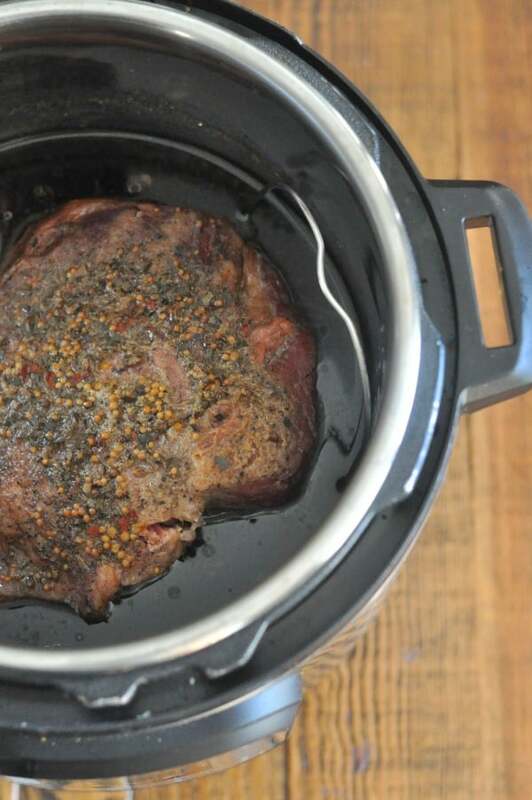 She forgot to put hers in the Crock-Pot (I’m totally guilty of doing this too) and said making it in the Instant Pot was the best corned beef she’d ever had. I bought a 4lb corned beef (totally recommend this size if your family loves corned beef). I use beer and beef stock on the bottom. Then I add the corned beef and the seasoning packet (included with corned beef). I also like to add ground pepper and onion powder. I’ve added coarse garlic salt too but I don’t think it really is necessary because the meat is already salty from the brine. I cook this Instant Pot Corned Beef on the steamer rack (also a recommendation from my best friend). 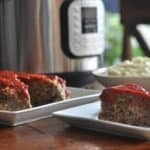 The meat is super juicy and the rack makes it easy to lift right out of the Instant Pot. Because the meat is shredded I could see it falling apart in the liquid and making it hard to remove once it is done cooking. 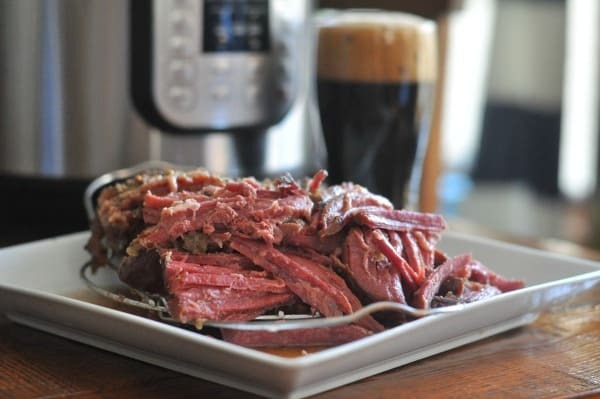 Because this Instant Pot Corned Beef takes 90 minutes to cook, plus cool down time, I recommend making it on the weekend when you have time and then saving some leftovers for during the week for leftovers (like Reuben sandwiches). 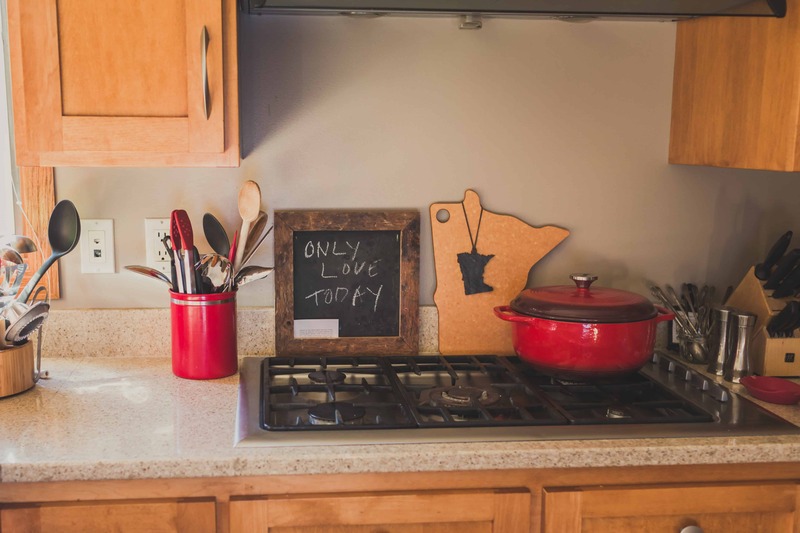 I love making this type of home-cooked meal and using the cooking time to do something fun with my kids or get caught up and ready for the week ahead. Plus I feel like I’m gaining extra time by having more time on the weeknights because I can just put the leftovers in the microwave to heat it up. 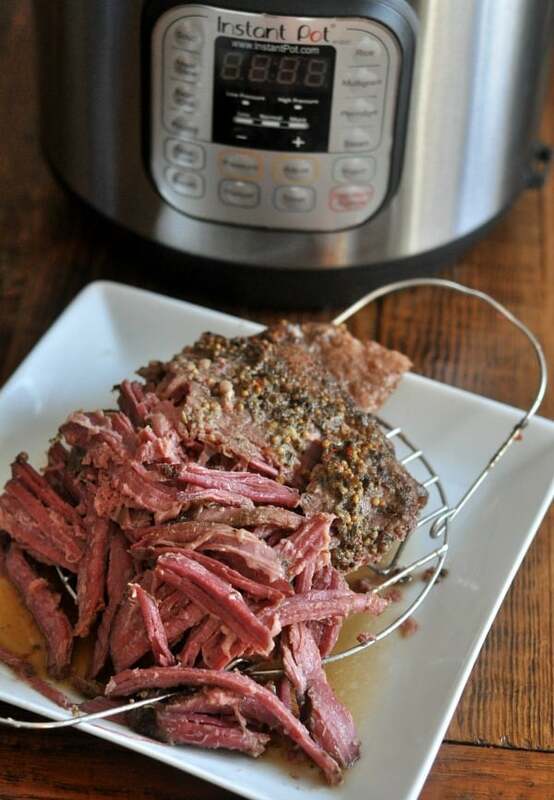 This Instant Pot Corned Beef recipe makes great leftovers, that’s why I recommend the 4lb corned beef! I know there is no way to get extra time to do all things we want and need but I really have found the Instant Pot is helping me get meal planning done in an easier way. I don’t have to babysit the food while it cooks in the Instant Pot and instead, I can do the things I really want to that day while the food cooks. Sometimes it is fun stuff like reading Wrinkle in Time with my kids or totally boring like laundry (hello giant sock basket that needs pairing). I’m thankful to my friend, Jaime for helping me put an awesome meal on the menu this week! 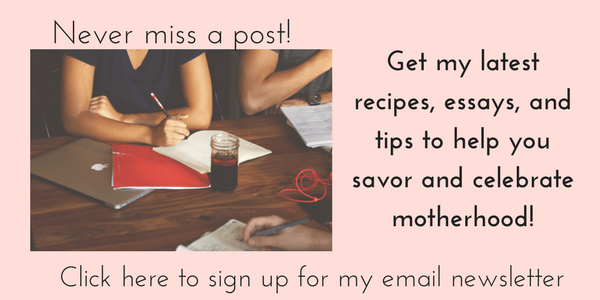 Have you made a great Instant Pot recipe recently? I’d love to hear about it! Buy a 4lb corned beef. It is enough for a family and allows you some leftovers. 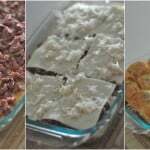 If you have 2 cups of meat leftovers, I highly recommend making my baked Reubens! I don’t rinse my corned beef or remove the fat before cooking. After it cooks, I remove fat and shred the meat. The corned beef is brined so it really doesn’t need extra salt, I’ve cooked it with garlic salt and while it tasted good, it really wasn’t necessary. Using beers like IPAs are not recommended for this recipe. Stick with a stout. 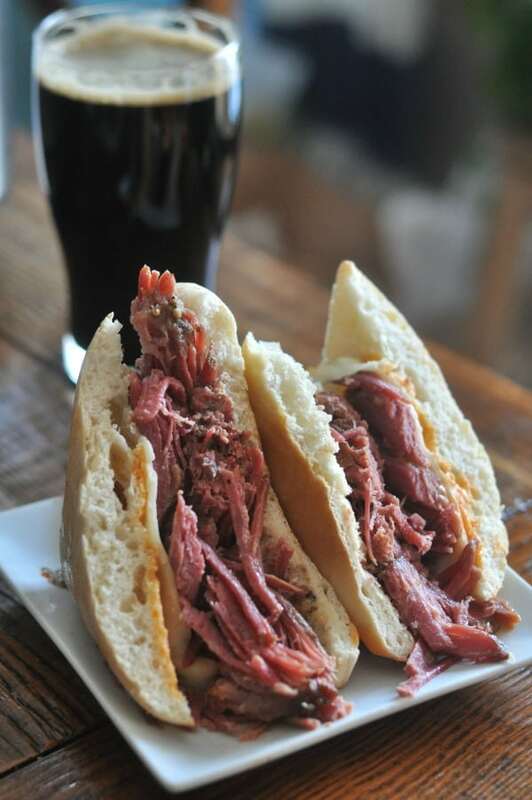 Remember using a stout with coffee, chocolate milk, bourbon, or other flavors will impart those flavors into your meat. I like to pour some of the cooking liquid on the meat when I serve it and if I have leftovers I store the meat in the fridge with the cooking liquid. You can serve the corned beef with mashed potatoes (when the corned beef is done place in a cooking dish with some of the cooking liquid, wrap in foil, and set aside). 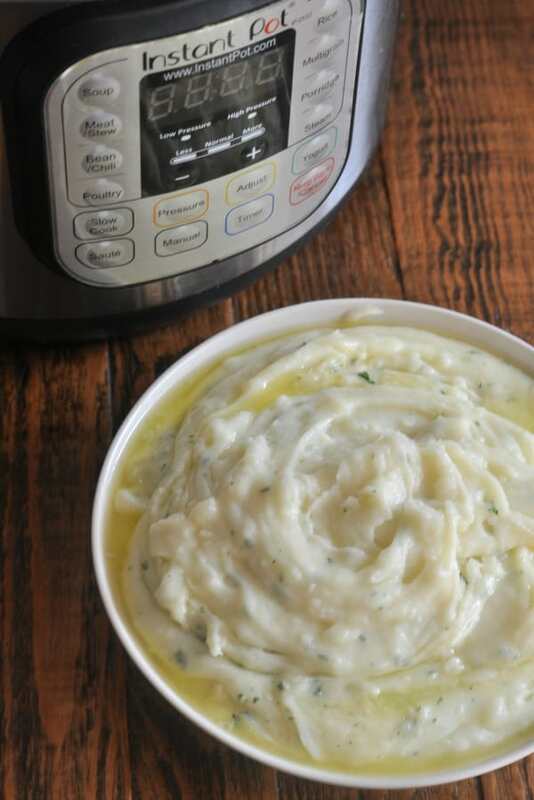 Remove any remaining cooking liquid, rinse the bowl, and follow my Instant Pot Mashed Potato recipe. Place Instant Pot steamer rack in your Instant Pot. 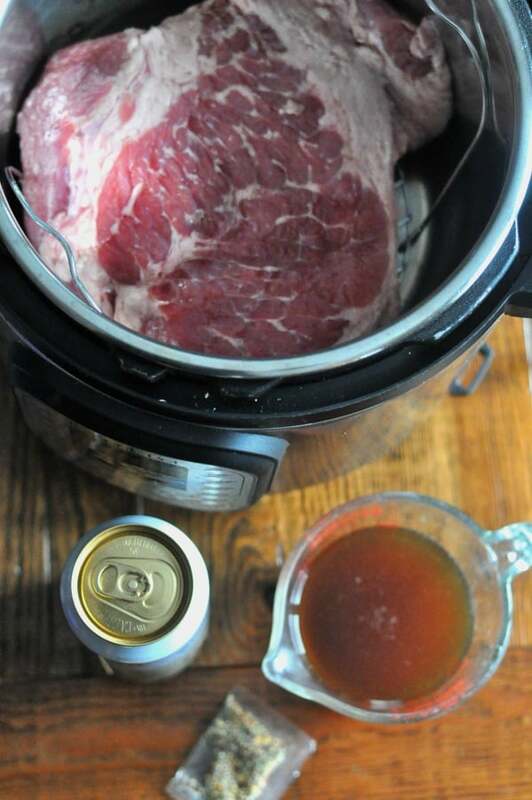 Place the can of beer and beef stock in the bottom of the Instant Pot. Remove Corned Beef from packaging and place on the rack. Season corned beef with seasoning packet, ground pepper, and onion powder. Lock the lid and make sure the valve is set to seal. Cook the corned beef on manual high pressure for 90 minutes. Once cooking is complete, allow the machine to go to keep warm function for 15 minutes, and then do a quick pressure release to open the lid. Serve with Instant Pot Mashed Potatoes or make into Corned Beef Sandwiches. You can also make this recipe in your Crock-Pot Slow Cooker by cooking on low for 8 hours. 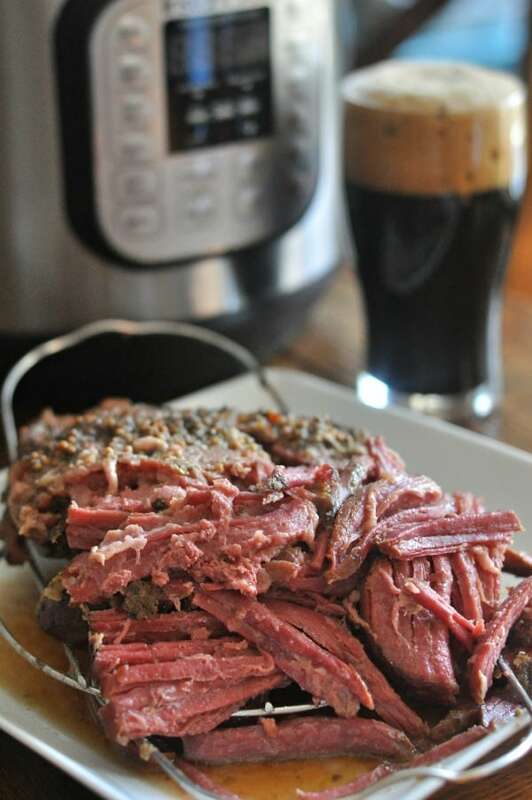 This entry was posted in Instant Pot and tagged beef, Guiness, Guinness, holiday, instant pot, St. Patrick's Day by Alice Seuffert. Bookmark the permalink. I am making this tonight! I love corned beef, so much that I have a sealing ring for the Instantpot just for making corned beef because of how much I make it. I look forward to trying your version out. Thanks so much, Tiffany! I hope you enjoy it! Curious–due to the meat being covered the whole cooking time will the alcohol cook off or be trapped/not evaporate? Hi JoAnna, I looked into your question and the alcohol will not all evaporate in an Instant Pot. If you wish to do an alcohol-free liquid, substitute the beer with beef stock (so a total of 3 cups for this recipe).